Ulinzi Warriors muted the roars of Nairobi City Thunder and Lions at the weekend to collect maximum points from two Kenya Basketball Federation men's Premier League matches. On Saturday, Ancete Wafula scored 19 points as the soldiers beat Nairobi City Thunder 66-47. The following day, Wafula scored 12 points for Ulinzi Warriors against Lions in a match they won 73-42. In this match, Ulinzi Warriors narrowly led 29-25 at half time. John Wasika was the top points scorer with 16 and Eric Mutoro had 14. John Ocholla replied with 14 points for Lions while Dommy Nick had 10. The United States International University - Africa Tigers narrowly beat Umoja 69-63. They led 37-25 at half time. Alex Ramazani had 20 points and Derrick Juma 15 for the students. Marvin Freeman scored 26 points for Umoja and Nick Ogoll 16. In the women's league, Strathmore University easily beat Egerton 45-9 with Caro Ouma scoring 12 pints for the sudents. Earlier, Masaku who on Saturday beat Egerton 66-40 in Nakuru completed a good harvest of points by edging out Africa Nazarene University (ANU) 74-61. They comfortably led 40-28 at halftime. Frida Gumba scored 30 points for the bankers while Sylvia Koech had 19. Diana Lukalo (17) and Tracy kadesa (12) top-scored for ANU. In one of the closes matches on Sunday, Lakeside beat KAA 66-60. Willis Ochieng scored 17 points and Dennis Wafula 12 for Lakeside. Ken Adodi was the top scorer for KAA with 20 points while Collins Adodi had 11. 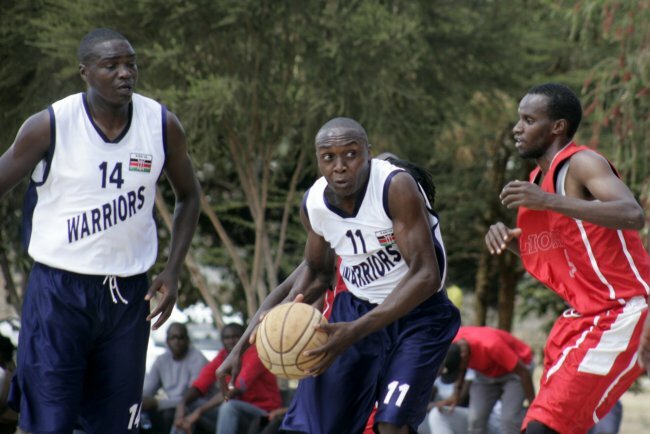 On Saturday, Umoja edged out Strathmore University Bladed 52-44. They led 23-20 at halftime. Michael Munene scored 20 points for Umoha while Michael Oketch scored 10 for Strathmore University Blades. Saturday: Egerton 40 Masaku 66 (Nakuru), Zetech 37 Lakeside 45, Africa Nazarene University 43 Nakuru Club 46, Equity Bank 46 Umoja 35 (Upper Hill), Strathmore University Blades 55 Mt. Kenya University, Thika 51, Ulinzi Warriors 66 Nairobi City Thunder 47, World Hoper 84 Eldonets 79, Umoja 52 Blades 44 (Strathmore University). Sunday: Footprints 41 KCA-U 20, KAAA 60 Lakeside 66, Egerton 43 Little Prince 50, Kenyatta University Pirates 68 Zetech 52 (Upper Hill School), Strathmore University 63 Lakeside 52, Masaku 74 Africa Nazarene University 61, Strathmore University 45 Egerton 9, Ulinzi Warriors 73 Lions 42, USIU-A Tigers 69 Umoja 63, Trailblazers 67 Zetech 51 (Strathmore University).